875 years of innovation and 32 generations of family pride. When we muse about carrying on the family business in North America, we generally collectively refer to the second or third generation. “My dad was a farmer and I’ve taken over the family farm.” If you’re tracing your inherited career back to your great-grandparents, you’re a rarity. Try to imagine being the 32nd generation family member of Tuscany’s Barone Ricasoli. That’s right – thirty second. Baron Francesco Ricasoli carries on the dream and the vision that his ancestor first began 875 years ago. Barone Ricasoli is the oldest winery in Italy, and said to be the second oldest in the world. In fact, Barone Ricasoli is the fourth longest-lived company in the world in the same place – in any sector. The name Ricasoli has been linked to wine since 1141, when Brolio Castle passed into the hands of the Ricasoli family. The family tree, a print of which dates back to 1584, is still intact, and representations taken from the intricate drawing adorn various labels in the wine portfolio. Of his striking labels, Francesco notes they are “not graphic new innovations from the scratch” meaning they all have some significance to the site’s history. By the start of the 1900s Brolio wines were known and exported all over the world: China, Saudi Arabia, South Africa, Guatemala, Costa Rica, and the then, British African colonies. Centuries of endurance aside, what is significant in the wine world is that Baron Bettino Ricasoli (1809 – 1880) is credited with perfecting the ‘recipe’ for Chianti in 1872. After more than thirty years of research and experiments, his modern Chianti formula was developed as a sangiovese-based wine. 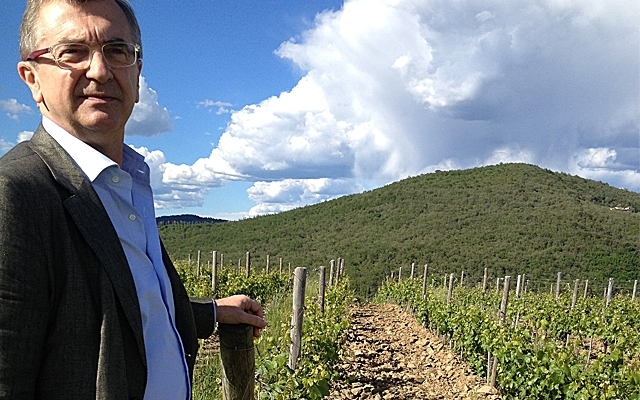 He worked with many different clones (more than 70 clones of Sangiovese have been established) refining and perfecting the vine to suit terroir and tastes. Prior to Ricasoli, canaiolo was emerging as the dominant grape in the Chianti blend, with sangiovese and malvasia playing supporting roles. Ricasoli’s recipe called for 70% sangiovese, 15% canaiolo, 10% malvasia (later amended to include trebbiano) and 5% other local red varieties. In 1967, the Denominazione di Origine Controllata (DOC) regulations set by the Italian government firmly established the "Ricasoli formula" of a Sangiovese-based blend with 10-30% malvasia and trebbiano. In 1996 the blend for Chianti and Chianti Classico was set at 75-100% sangiovese, up to 10% canaiolo with up to 20% of any other approved red grape variety such as cabernet sauvignon, merlot or syrah. Since 2006, the use of white grape varieties such as malvasia and trebbiano have been prohibited in Chianti Classico. The current company Presidente, Francesco Ricasoli, has been instrumental in resurrecting the family name to past glory. After decades of decline in the mid 20th century, Francesco’s father sold the winery and brand to Seagram’s in the 1970s, a time that Francesco remembers as “an agonizing period for the family.” In the early 1990s, Francesco and his father worked diligently to buy it back, completing the purchase in 1993 and only looking forward since then. According to Francesco, they’re carrying on the spirit of his pioneering ancestor, “breathing new life into the region through diligent research and experimentation.” Since the two decades that Francesco has been driving the program, the winery has carefully catalogued and typified soil types, vineyard plots and clonal selections including officially identifying one or more indigenous Brolio clones. He enlisted the help of renowned Tuscan oenologist Carlo Ferrini in the revamp of the winery and vineyards, and restored and modernized most of the facilities and estate. The estate currently farms 230 HA of vineyard, the largest privately owned estate in Chianti Classico, with a shifted focus to making wines that reflect its terroir. Each vintage the winery completes approximately 200 separate vinifications, looking at plots individually to determine what is working best. Looking forward to the next 32 generations, the winery is doing trials with organic viticulture (30 HA is organically farmed) and carrying out important studies on the use of natural fertilizers derived directly from grape stems, with the goal of further reducing the use of chemicals in the vineyards. “Our current research has almost a thousand years behind it” according to Francesco. The experimental, innovative gene must be in his blood – perhaps also in his Sangiovese - 32 generations deep. Here are the Ricasoli wines we've tasted at GOW over the past year. Anthony will be sitting down to chat 1,000 Years in Tuscany at Vancouver International Wine Festival later this month.